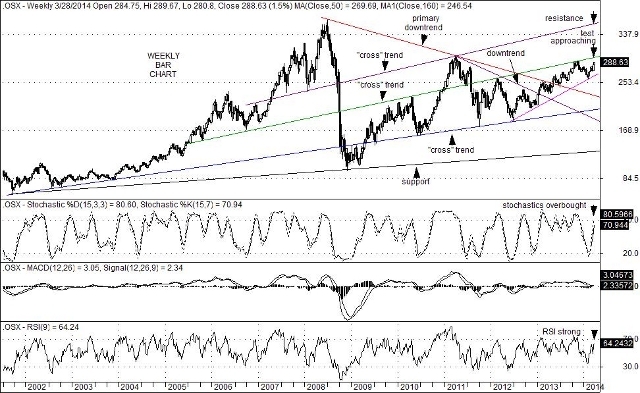 Oil Services Sector Approaches Key Resistance; Can It Break Higher? On weekly bar charts, the Philadelphia Oil Service Sector Index (OSX) is now approaching a test of key “cross” trend line resistance located at the 299 level. With overbought conditions present as well, a technical setup such as this would normally argue for a correction to occur after key resistance is tested. Moreover, a number of fundamental energy analysts are now suggesting that a sharp pullback in oil prices could emerge soon. If it does, a rejection of price from the 299 level could paint a troubling picture for oil companies in general. Nevertheless, from a technical point of view there are a number of the components within the OSX index that appear poised to move higher. Clearly Diamond Offshore Drilling, Inc. (DO) and Transocean Ltd. (RIG) are each in oversold conditions, having been crushed by the BP Gulf of Mexico oil spill in 2010. Still, both are near their 10-year price lows and are each responding with basing price activity. Others, such as Weatherford International Ltd. (WFT), Rowan Companies (RDC) and Ensco (ESV) have already rebounded from their respective lows and appear to be in position to extend much higher. Clearly, names like Halliburton (HAL) and Helmerich & Payne, Inc. (HP) have soared since their lows of June 2012 with momentum investors still involved. As a result, a test of key resistance at 299 on the Philadelphia Oil Service Sector Index (OSX) could be met with profit taking. On the proverbial other hand, a solid break above 299 could propel the OSX to much higher levels and possibly take aim at an eventual test of key trend line resistance currently sitting near the 358 level (but rises over time). This entry was posted on Monday, April 7th, 2014 at 12:33 pm	and is filed under Philadelphia Oil Service Sector Index (OSX). You can follow any responses to this entry through the RSS 2.0 feed. You can leave a response, or trackback from your own site.